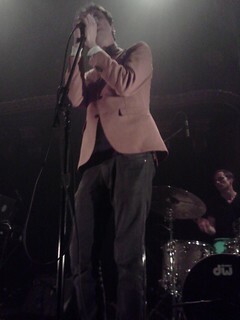 The night had finally arrived and I was finally going to see Efterklang. I had somehow missed them in NYC even after I had tickets. I don’t even want to know why/how/what I was thinking. With that being said – after waiting for what seemed like forever – the band came out and put on one hell of a show. 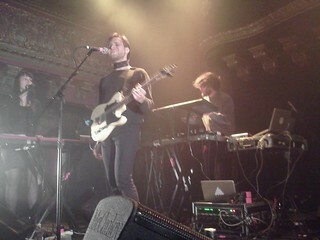 The 3 piece band from Denmark (touring with an additional 3 people), were nothing short of incredible. Casper is an incredible front-man. He was very excited and beyond happy to be playing once again in San Francisco. Their bassist, Rasmus, had a huge smile on his face for nearly all the songs. He just beamed pure happiness. The biggest highlight of the night was easily Katinka. Her voice was just magical and it was surprising how well an opera singer fit in with the band. She just blended so great the way her sound mixed in with the songs. Their new album, Piramida, is quite simply beautiful. Everything about the organic sounds, the way the music emotes, and how it comes together is just amazing. The band took field recordings while out in Spitsbergen (between Norway and the North Pole) and it fits so amazingly into their music. All these organic sounds layered on top of keyboard pieces is just something else to hear. You feel like youve actually been transported into this world — of a faraway place with nothing just you and nature and probably a lot of cold and ice. While its not dreary in the least, it does have that dreamy hazy sound. 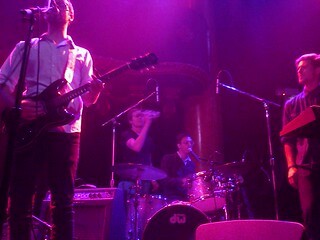 The band opened with Hollow Mountain (off of their new album) with the haunting vocals/sounds from Katinka. The sound slowly grew with some sort of metal being hit (thanks to amazing work done by Mads) and then Casper joined in. It was a great song to open with. Casper is theatrical making great use of his hands and body. The set continued pretty quickly and included Apples (which really reminded me of The National) and Sedna off the new album. A lot of what they were playing was off Piramida, and really if you dont own it, you should. Or at least give it a listen. One of the cool things about the show was when Casper started to read ‘cards’ left from other shows to people/friends and just SF in general. Some were about making sure to enjoying the beach – laying out in the sand – to others about friends missing each other – and my favorite about how awesome the band is and the friend was so grateful for sharing it. Those kinds of things are just awesome. Casper also shared the lovely smells of Big Sur in the form of a rock (or maybe piece of wood) that he shared with an audience member. And lastly, the show had one of the youngest people ever enjoying it. A little boy who might have been 4-5 showed up with his mom and asked to stand in front for a song or two. It was pretty exciting. Nightlands opened the show. Their set was quite great and reminiscent of another Philly band – Sun Airway. Their songs had a great dreamy/psych sound to it. Some of the songs felt like they could have been from Snow Patrol with big sounds and harmonies. And it was great when Efterklang’s drummer, Tatu, joined them for a song. You could tell there was a lot of appreciation between the bands for each others music. I wish I could be seeing them again — and next time hopefully they will play with a full orchestra. Now that would be something else! And to the guy from last night – I will have the pics posted in the next day or two. These were off my phone. I apologize – but check back (or just go to flickr).